You will not be disappointed by our selection of stuffed plush rays if you are searching for a stuffed stingray, plush manta ray, stuffed eagle ray, or the like. However, if you were looking for a plush Ray Charles or stuffed Ray Liotta, sadly, we can't help you. That said, if you are looking for one of these fabulous aquatic stuffed animals then you are on your ray, uh, way. 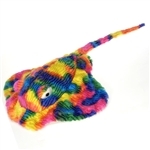 From the small stuffed stingray and manta ray clip on critters to the jumbo 67 inch stuffed spotted eagle ray, we carry many varieties of stuffed rays by the always fantastic Wildlife Artists. 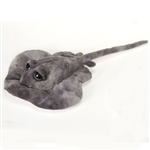 Beyond our wonderful Wildlife Artists items, we offer several other species, colors, and sizes of stuffed plush rays by many of our other manufacturers. Fiesta makes highly realistic versions of a stuffed spotted eagle ray, a plush southern stingray, and a stingray that looks like it was plucked right from the ocean. Check out all of our stuffed rays and plush rays below to see all of these great stuffed aquatic animals that we have available. And, for those of you looking for a stuffed Ray Manzarek, sorry we couldn't open any doors. Happy searching!